There’s no doubt in our mind that you will be immediately hooked when you take your first bite of a 350° Cheese Straw®, so much so that you’ll most likely reach for another one. Our cheesy treats are a true Southern tradition, and are handcrafted in our kitchen in Beaufort, North Carolina. Using a guarded family recipe, owner Ashley Sellers personally bakes each cheese straw to perfection, using only the highest quality ingredients. If you haven’t tried our cheese straws, it’s time to change that. You can learn more about our story and place your order online. You’re not going to regret it. We know our cheese straws are mouthwatering. That’s why we believe they make the most perfect gifts for any occasion. Find a short cheese straw gift guide in a recent blog post. 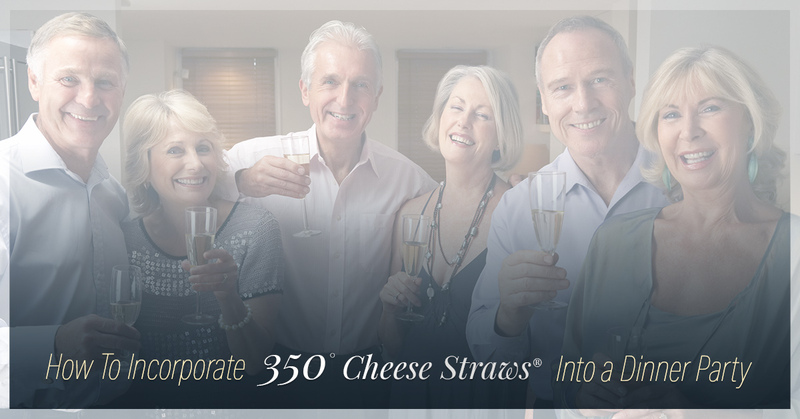 That being said, we also believe our straws are a one-of-a-kind treat to share at dinner parties. If you’re hosting a dinner party and are wanting to incorporate 350° Cheese Straws onto your dinner table, today’s blog post is for you. When your guests arrive, have a small table with light treats and drinks available for them to snack on as they chat with each other and wait for dinner. Place a tin of cheese straws on said table, or display them in a dainty bowl or platter. The straws will be gone before you know it. When placing the food on the dinner table, you can fill in the gaps in the setting by placing small bowls or plates of cheese straws. Guests can choose to eat them with their main course, or they can snack on them throughout the course of the meal. Once dinner is completed, you may provide tea, coffee, dessert, and light finger foods for your guests to enjoy as they continue to have a good time. Cheese straws can easily be incorporated into this. Set out a few tins of straws with after-dinner coffee and tea, and you’ll see just how popular our cheese straws are. Depending on the reason or size of your dinner party, you can gift your guests with their own tin or small container of cheese straws to take home and enjoy for themselves. As you can see your options with cheese straws are endless. If you’re interested in incorporating our savory treats into your dinner party, purchase your tins online today! One bite and your dinner guests will be hooked.